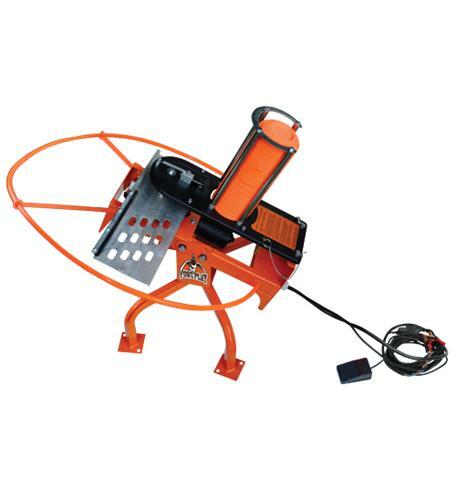 - Do-All's Fowl Play Auto Trap sports a 25-clay stack and fires targets up to 55 yards. 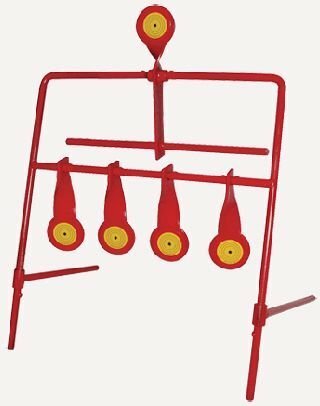 - Its feeder tray smoothly transfers pigeons onto the throwing arm, and target angles can be easily adjusted from 5� to 35� for a variety of shooting scenarios. - Also features an adjustable limit switch for timing adjustments in the field. Included ground spikes reduce vibration and increase stability. 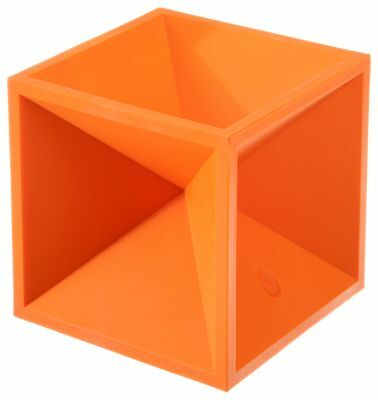 - Orange safety-ring attachment keeps shooters clear of danger areas. 25-ft. foot-pedal release for easy hands-free operation. - Compatible with Do-All Wireless Remote and Outdoors Wobbler. Powered by 12-volt deep-cycle marine battery (not included). - Rated For all calibers .22 � .5O Cal. 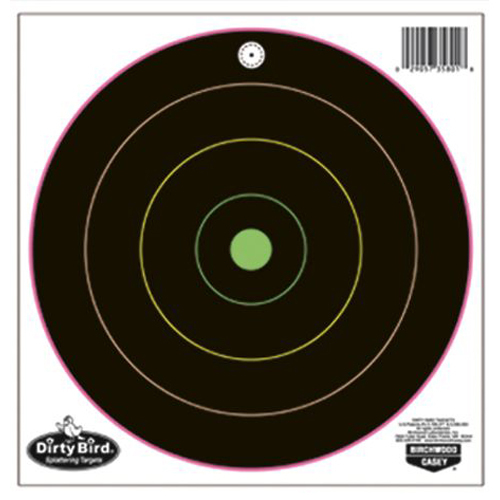 Dirty Bird Multi-Color Splattering Targets 8" - Dirty Bird introduces the new Multi-Color Splattering Targets. 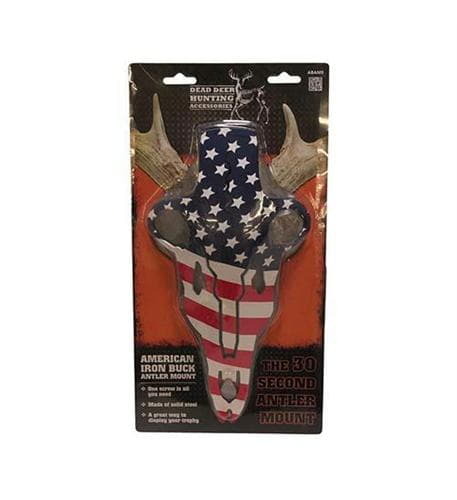 The idea is the same as the standard Dirty Bird targets G+( the name comes from the splatter of color that appears upon bullet impact, which makes the hole highly visible even at a distance! Plus, the multi-color targets also show you how good your shot is without having to walk down range. The concentric circles of the bullG++s-eye each have their own color splatter, so you can tell by the color how close you are to the center! Heavy tagboard construction makes these targets extra durable, and the non-adhesive back allows you to affix to a surface as you wish, add notes and then easily save the target for future reference. 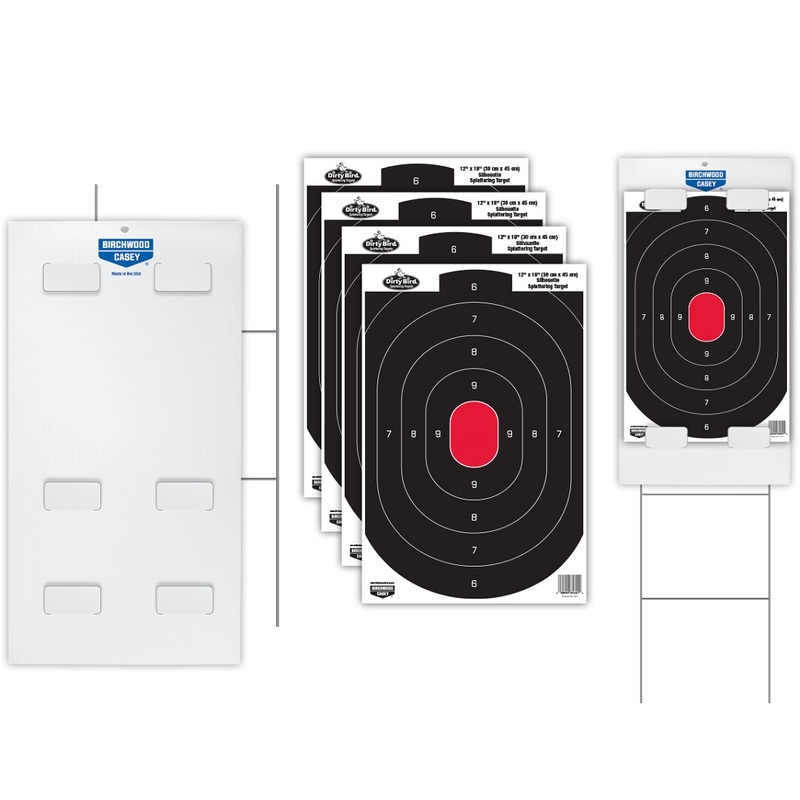 Features: Instant feedback; Maximum visibility; Great for indoor and outdoor use; and Excellent value vs. paper targets. 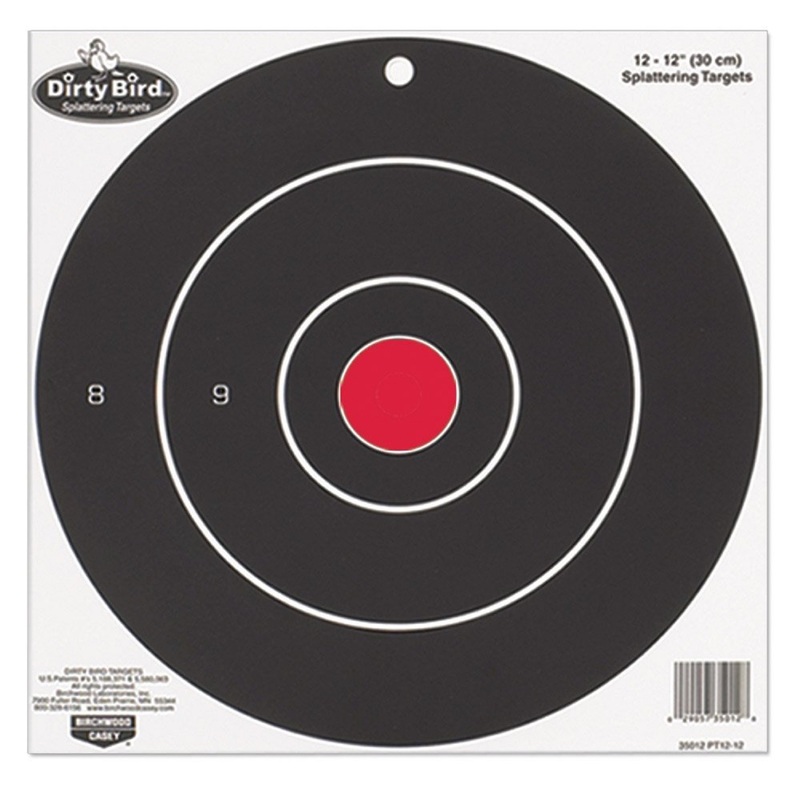 These targets offer the great features of the Dirty Bird Multi-Color, and come with an aiming point for open or scoped sights. ThereG++s even a tie-breaking ring in the center! Handgun shooting has never been easier. Now practice or train on multiple designs. Based on the classic B-27 targets, these formats work great at practical training distances. Simple to play, and just as simple to install. Don't fret, we've included everything youG++ll need for quick and painless setup, including easy to follow directions. 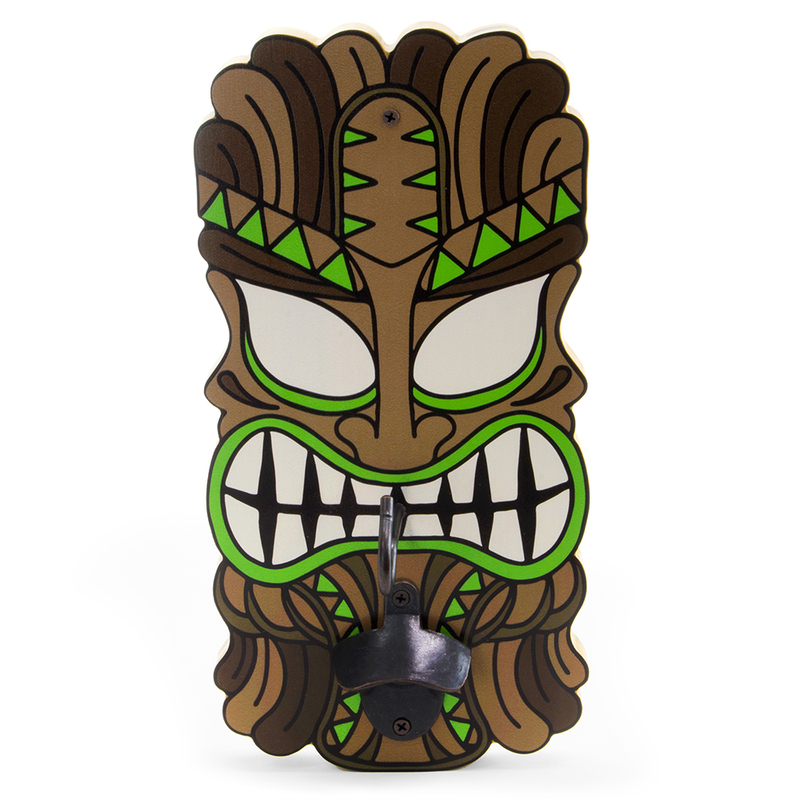 Mount The Big Kahuna mask on the wall, attach the eyehook to an overhung pole or screw it right into the ceiling. Then sit back and try to master your aim and precision. Don't forget to crack open a cold one with the included bottle opener! 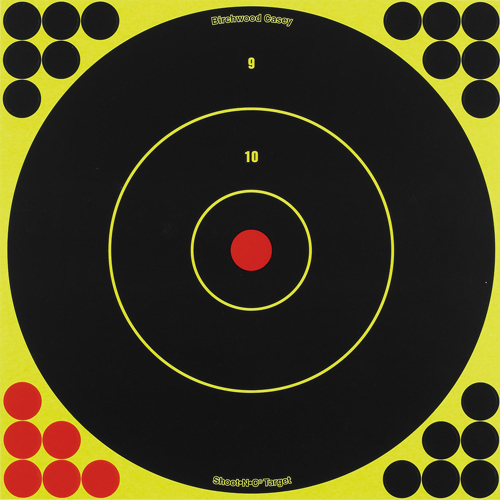 Convenient, self-adhesive, fluorescent red TARGET SPOTS create instant bullG++s-eyes. Radiant red color lets you see a sharper sight picture and bullet holes more clearly for better scores and smaller groups. A perforated back panel makes this package a handy TARGET SPOTS dispenser! 10 sheets per pack. 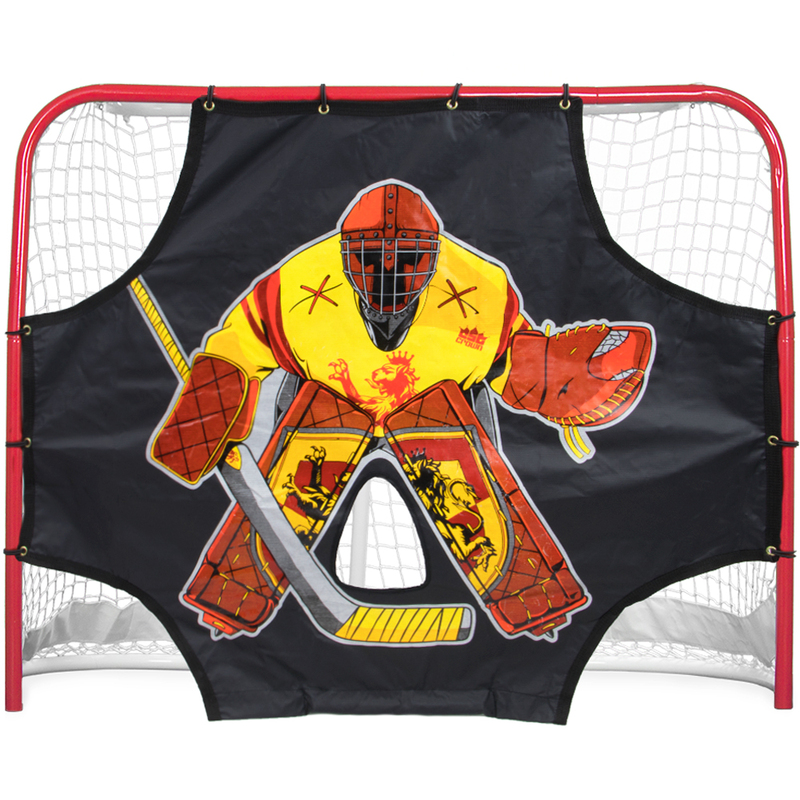 Ultimate Red Knight Street Hockey Shooting Target 54" x 44" Ultimate Red Knight Street Hockey Shooting Target 54" x 44"
Sharpen your shooting skills... No goalie required! The sharpest shooters know that the key to scoring on your opponent is to develop a wide variety of shots. That's why we've designed a hockey target with 5 key zones. It imitates a real goalie experience to improve all your shots: wrists, backhands, snaps, and slaps. You can take it to the streets and attach it to any 54" x 44" goal. Beginner and intermediate shooters will be able to take their game to the next level. Our targets are constructed with thick, durable PVC tarpaulin that's waterproof and weatherproof. It has reinforced edges and metal ringlets that can withstand all the beatings of a hard practice. The included bungee fasteners make set-up and tear-down a breeze. They will last longer than any standard hook and loop fastener. We've also included a weighted bottom to keep the target rooted in place on windy days. With your goalie printed right on the target, you'll never have to practice alone again. Brybelly Notes: This product is a goal target only and does not include a hockey goal. 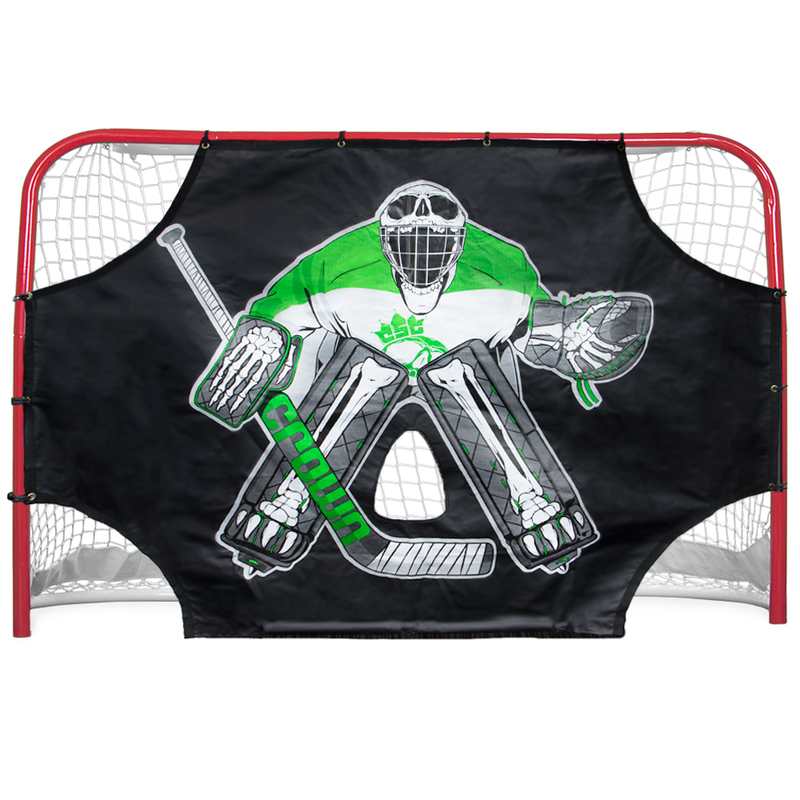 Green Skull Sniper Street Hockey Shooting Target 72" x 48" Green Skull Sniper Street Hockey Shooting Target 72" x 48"
The sharpest shooters know that the key to scoring on your opponent is to develop a wide variety of shots. That's why we've designed a hockey target with 5 key zones. It imitates a real goalie experience to improve all your shots: wrists, backhands, snaps, and slaps. You can take it to the streets and attach it to any 72" x 48" goal. Beginner and intermediate shooters will be able to take their game to the next level. The BW Casey Target - Spot Assortment create an instant bull's eye for all types of target practice and are perfect for the avid shooter. The high-contrast red color lets you see a sharper sight picture and bullet holes more clearly for better scores and smaller groups. There are sixty 1 inch spots, thrirty 2 inch spots, and twenty 3 inch spots. These revolutionary self - adhesive targets explode in color upon impact. And the bright yellow ring around the bullet hole is visible to the naked eye G+( allowing you shot after shot without interruption. So forget hunting for cans; load up on SHOOTG+=NG+=C targets and let the fun begin! 30 per pack. 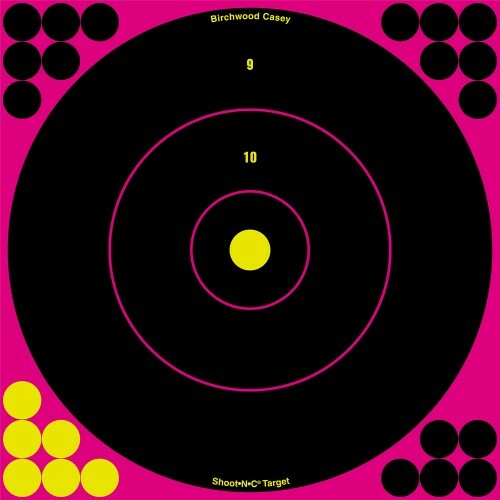 The BW Casey Shoot-N-C 3 Inch Target 12 Sheet Pack reveal each bullet hit with a brightly colored ring. The chartreuse on black coloring is easy to see for maximum visibility. 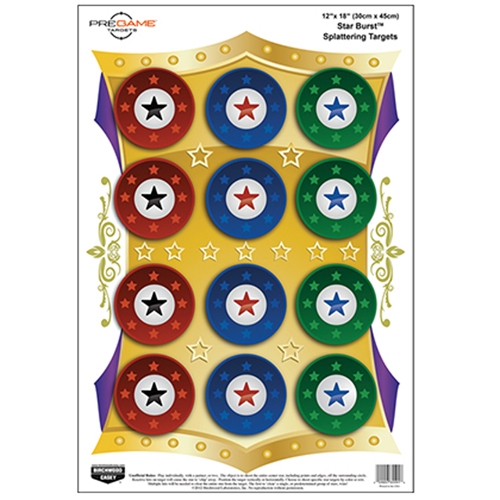 The self-adhesive backing lets you set up with ease, and each target includes pasters that let you patch the target up, extending the target's life. New technology creates reactive zones within the target! A shot outside of the main aiming points will not produce a halo. Fun for all ages! 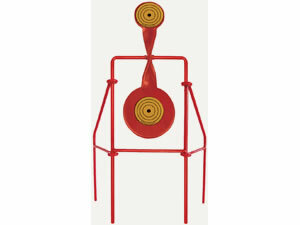 Improve your shooting skills with these colorful Dirty Bird style targets. Use them while shooting alone or appeal to your competitive side and shoot with a partner. Be creative, there are no official rules of play, create your own and have fun. 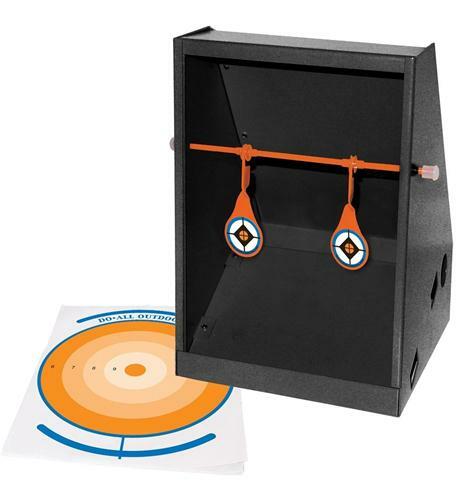 These new Sharpshooter TabLock Target Kits are designed to accommodate all of our popular 12" and 12" x 18" targets. The target board incorporates TabLock cuts that firmly grip and hold targets for your shooting enjoyment. With the TabLock there is no need for staples, tape, or adhesive targets. The Sharpshooter TabLock kits are available with two offerings of intense, white splattering Dirty Bird Target assortments. Reusable, portable, and affordable. The BW Casey Dirty Bird 8 Inch Target shows a splatter of white upon bullet impact. The non-adhesive back also allows you to affix to any surface, add notes, and then easily save the targets for future reference. There are 25 sheets per pack. 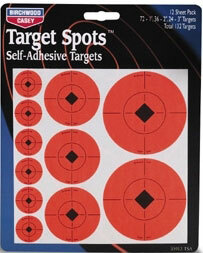 The BW Casey Target Spots 1 Inch 10 Sheet 360 Target Pack are self adhesive spots that are perfect for the avid shooter. These convenient targets create an instant bull's eye for all types of target practice. The high-contrast red color lets you see a sharper sight picture and bullet holes more clearly for better scores and smaller groups. This target comes with corner pasters for extended target life and for use as secondary targets. Reacts with a pink "halo." Caldwell Duramax Target Ball is made of ballistic polymer for maximum durability. The ball target is self-healing, so go ahead and shoot it thousands of times. 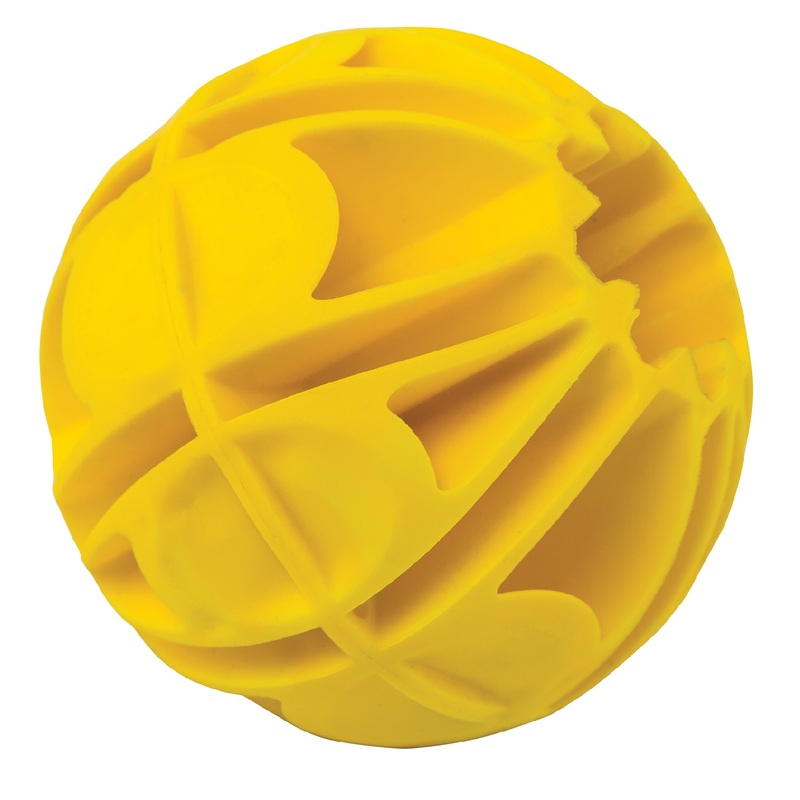 When hit, the ball target reacts by bouncing, rolling, spinning, or flipping. 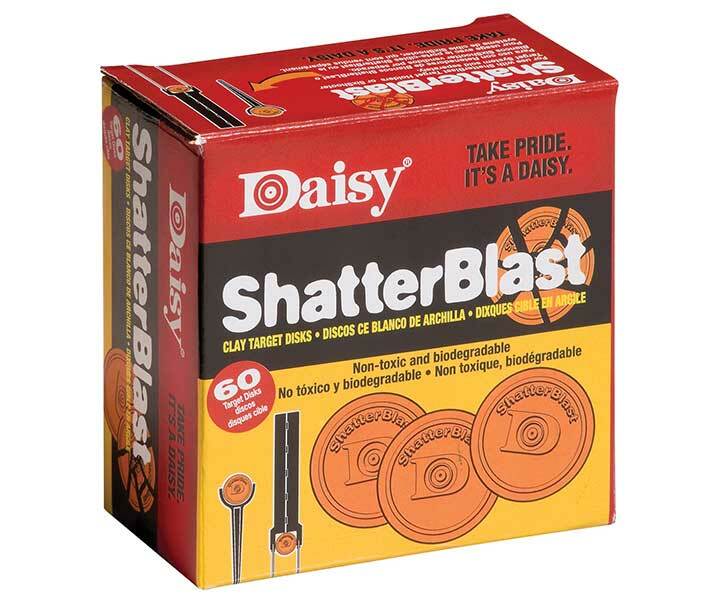 Rated for pistols or rifles from .22lr all the way up to 50 BMG. A splatter of white appears on impact. Sighting-in up to 400 yards away is a snap with this 12" target. 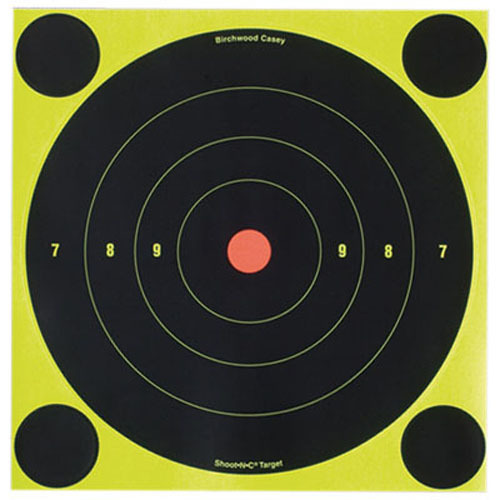 5 bull's eye targets in one for checking different ballistic loads or more shooting fun. Complete with 1" grid pattern and stadia lines for more precision. Aiming point on each bull's-eye for open or scoped sights. 12 sheets per pack. Get more pleasure from your plinking with Spinner Targets, available in both Rimfire Rifle and Centerfire Handgun. 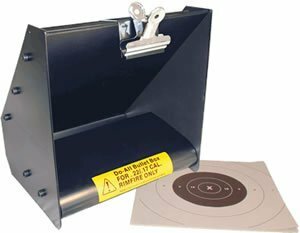 These sturdy targets feature solid steel welded construction for lasting durability. One hit spins the diamond-shaped targets, and they automatically return to position for the next shot. 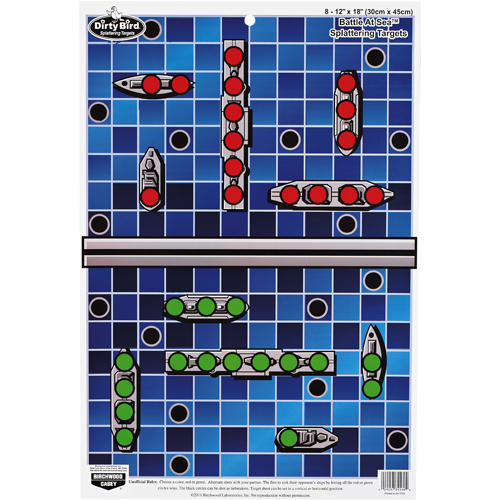 Dirty Bird Battle at Sea 12 x 18 Game Target 8 Pack - Fun for all ages! 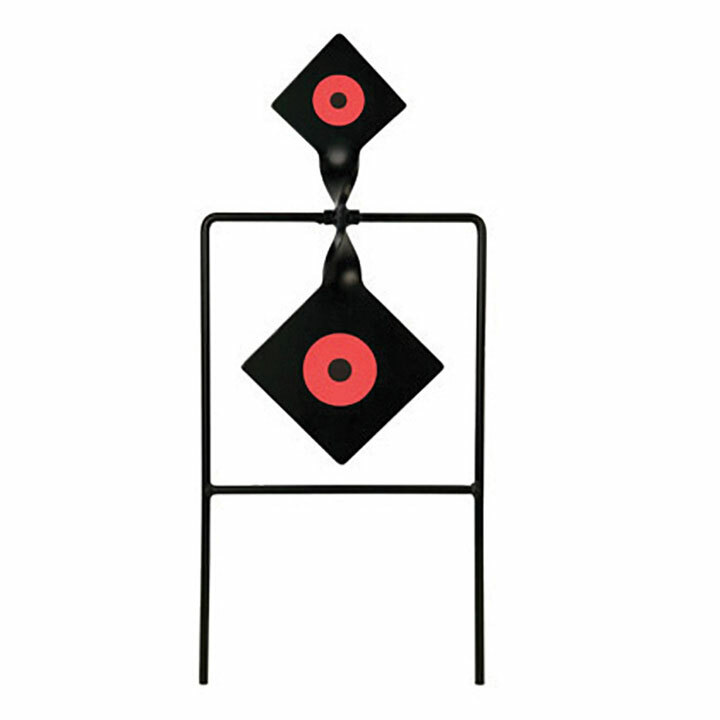 Improve your shooting skills with these colorful Dirty Bird style targets. Each shot will G++haloG+- white so you instantly know where your shot has hit. Use them while shooting alone or appeal to your competitive side and try to beat your shooting partner! With Battle at Sea, try to sink all of your opponentsG++ ships before they get yours! The BW Casey Darkotic Fine Print Splatter Target explodes in a white halo around the bullet hole. 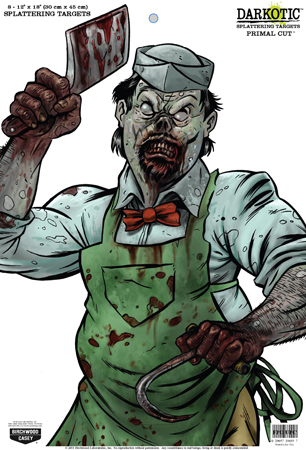 The target features a zombie print on it. The target measures 12x18 inches and comes in an eight pack. The BW Casey Darkotic Primal Cut Splatter Target explodes in a white halo around the bullet hole. 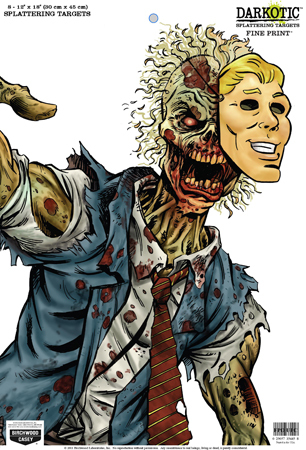 The target features a zombie print on it. The target measures 12x18 inches and comes in an eight pack. 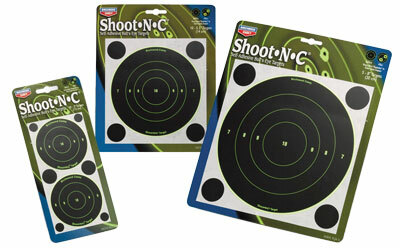 Shoot-N-C Self-Adhesive Targets 12" BullG++s-Eye Packs - The biggest bullG++s-eye targets we make. 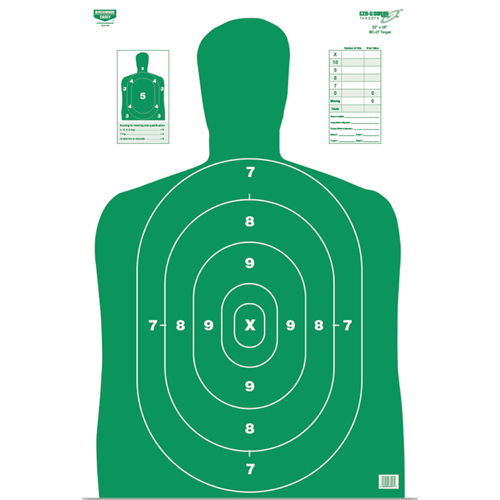 These targets are great for long-range rifle shooting G+( 200 yards and beyond! The greater surface area makes them the perfect choice for use with muzzleloaders, shotgun slugs and to show shotgun patterning. 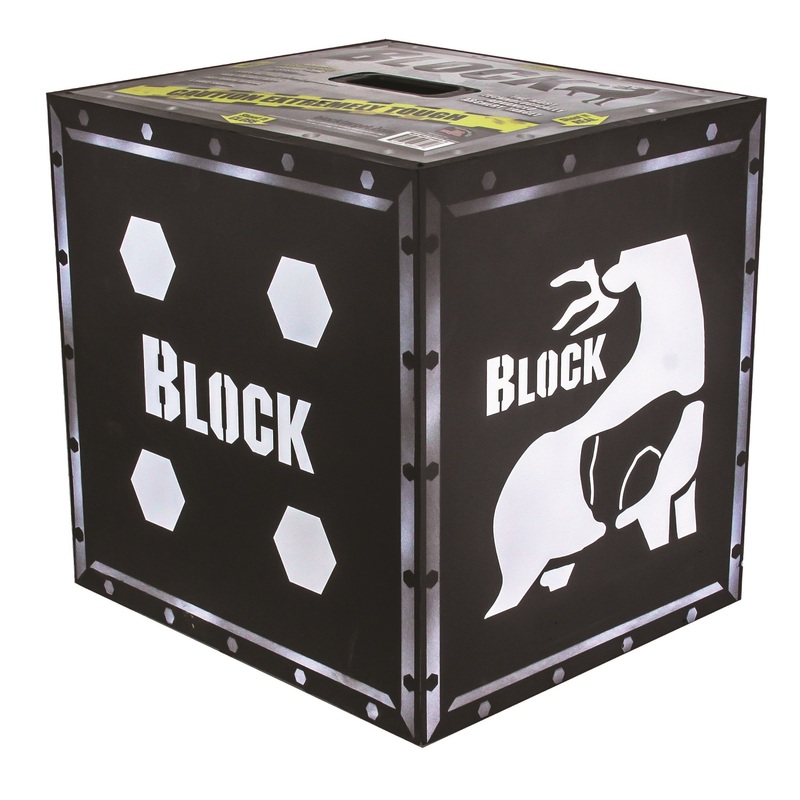 The Block Vault archery target incorporates a locked-in, high-density layered core for an even longer target life. It has 4 shootable sides and features multiple, offset aiming points on each side, providing shooters specific practice shots to help them increase accuracy before the hunting season and all year long. The Vault features easy arrow removal and long target life, for practice all year long without the fear of wearing down the target. Comes in size medium with dimensions of 16"x16"x12".